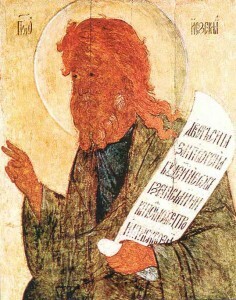 Celebrating the memory of Thy prophet Ezekiel, O Lord, through him do we entreat Thee: Save Thou our souls! O God of our fathers, deal with us ever according to Thy meekness. Take not Thy mercy away from us, but by the supplications of these saints direct our life in peace. Thou hast been shown to be a prophet of God, O wondrous Ezekiel, and hast proclaimed unto all the incarnation of the Lord, the Lamb and Creator, the Son of God Who hath revealed Himself forever. Let us praise the God-bearing Symeon, the peer of the angels, who appeared in the flesh as one incorporeal, and with him the ever-memorable John: for with faith and love they entreat the Lord unceasingly in behalf of us all. There will be no mid-week services this week due to St. John’s Family Camp. You are more than welcome to take day-trips there and participate in the services and activities. There will be a Parish Council meeting following the Divine Liturgy today. Next Sunday we will serve the Akathist to the Mother of God, Nurturer of Children before the Divine Liturgy (8.30 am). Confession after Vespers or by appointment! If Catechumen class will follow the service, Fr. Andreas will be available for Confession and hour before Vespers. Why do you worry and grieve more than necessary? “Why do you worry and grieve more than necessary for the various incidents? We are not outside of Divine Providence, so as to be directed by mere chance. Therefore, whatever happens to us happens with God’s knowledge, and so nothing will happen to us beyond our strength! Let those who do not believe in Divine Providence drown in worry; they are certainly justified. But we, who believe that God is present everywhere and that there is no creature outside His providence, are not justified when we worry more than necessary, for through this action we show a lack of faith and illumination.